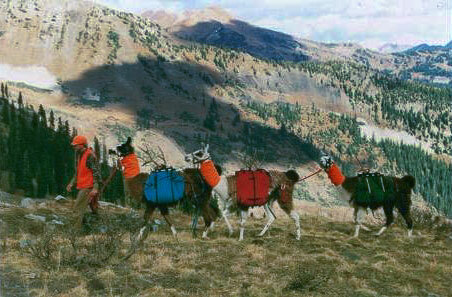 To some hunters, a llama might be confused with a big game animal. Probably not out in the open like this with packs on. But back in the woods might be another story. We use a hunter orange neck collar during any hunting season and sometimes an orange blanket during the rifle big game seasons. On this September bow hunt, I saw elk every day. I had to move camp every other day to keep up with the migration of the herd. The llamas made it possible! Getting into the back county where the game is and other hunters aren't is the key to a successful hunt. You also need to be comfortable to stay with it until your find the animal you came for. Once you've filled your tag, the work really starts. 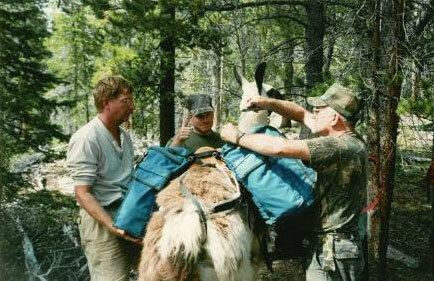 With our boys to carry the load, you'll be whistling all the way back to the truck. 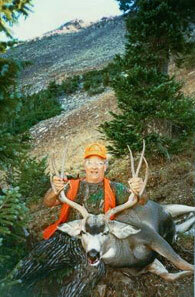 On this successful rifle hunt in the Colorado Rockies, the llamas packed out one bull elk and four mulies. 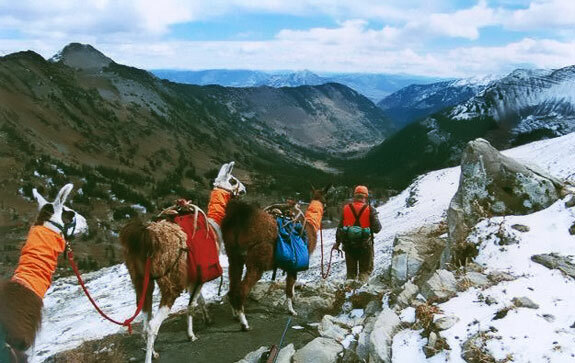 We were back into the wilderness over two mountain passes above 11,500 feet in elevation. 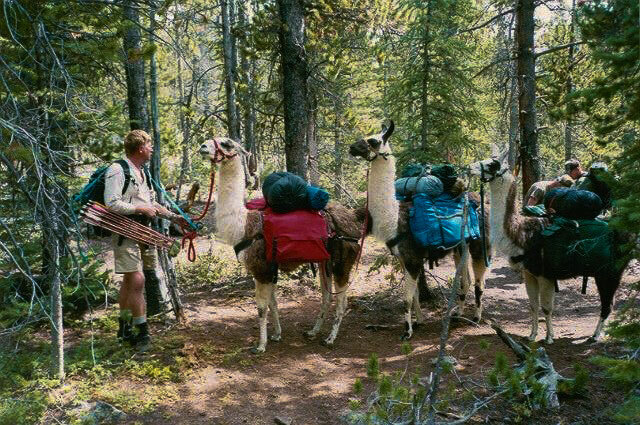 The llamas never complained a bit. Can you say that about your hunting buddies? This county is steeper than it looks. 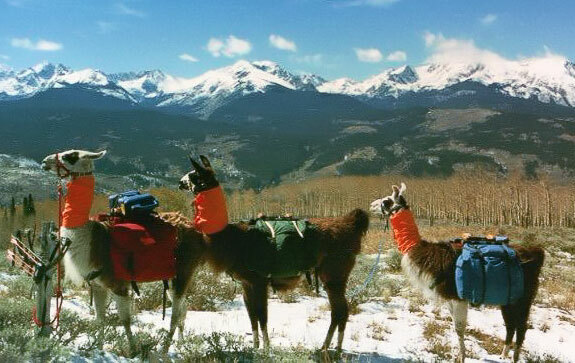 How come in the Rockies, it seems like everywhere you need to go is uphill? Jim Roberts, a taxidermist from Russellville Arkansas had a great high county wilderness hunt! The boys are a little slower going uphill in steep terrain, which is good! It makes it easier for me to catch em! and still be where the animals are at daylight. 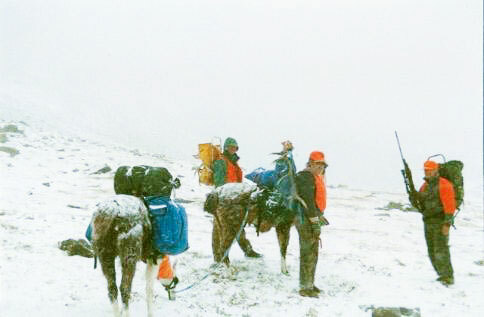 the mountain, we pack up camp and go with them. Smooth, silent and trouble free! It's not always a walk in the park. But we love it anyway!